Cyril O’Boyle was one of the great characters In the sport. A quite superb athlete over a long period he also had a mischievous sense of humour and was one of the few athletes I have met who could transform the performance of a team just by turning up to run. Coming from Northern Ireland he had won many titles and trophies there before coming to Scotland. He had won the North of Ireland Senior and Junior Cross Country Championships in the same year and also the Irish equivalents in the same year. Typically for Cyril, when he moved to Scotland nothing went smoothly. There were two governing bodies for the sport in Ireland, the NIAAA (Northern Ireland AAA) and the NACA (Northern Athletic and Cycling Association) which did not see eye to eye with each other. When he came to Scotland and joined Victoria Park AAC he had difficulty getting permission to run because the NACA was proscribed by the SAAA who only recognised the NIAAA! He returned to Ireland where he was banned by the NACA who did not recognise the SAAA. Then he came back to Scotland and chose to run for Clydesdale Harriers and again had to seek permission from the SAAA (who did not recognise the NACA)! Fortunately the permission was forthcoming and Cyril (and later on his family) was able to race for Clydesdale Harriers. Cyril was born in Kinclasslagh on 23rd February 1926. The family emigrated to America when he was an infant but returned to Ireland when his grandfather died when he was seven years old. He worked for a time at St Coman;s Hospital and then moving to England for a short spell before settling in Scotland. His career as a runner was quite outstanding. His quality was such that he is still almost revered in Ireland. 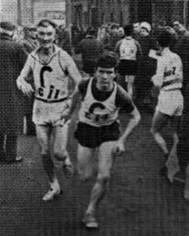 If you look at the internet site for the Strabane History Society there is an entry in the sports section which reads: “In 1950 Cyril O’Boyle from Letterkenny, registered as a Strabane athlete, won the All Ireland NACA (I) Junior Cross Country Championships at Graystone, Co Dublin. Three months later O’Boyle won the senior event to become the first Irishman ever to record both events in the same year.” Very few athletes were mentioned by name in the section. The Finn Valley AC site was even more fulsome in its praise and a bit more detailed about his career with this piece in an account of sport in the Rosses district. “It is fitting that we should end this study of our long distance runners with an account of the feats of Cyril O’Boyle. Though his parents were not natives of the Rosses, he was born in Belcruit and attended Belcruit National School. Reared in an athletic atmosphere where to shine as an athlete was the main ambition of the Rosses Youths, O’Boyle while yet a schoolboy outshone all his pals in long distance races. It was no disgrace for his school friends to suffer defeat at the hands of O’Boyle for one day he was to meet and defeat the best athletes in Ireland. Cyril’s athletic ability was always taken as read. In the first place he was a notoriously hard trainer. No run with Cyril was ever an easy run or a steady run: it was always a hard testing outing for the rest of the pack or whoever he was out with. At one point he was asked to work with young Phil Dolan who went on to become a Scottish Internationalist on the track and over the country. Phil will tell you that Cyril never did anyone any favours on a run: even with a 17 year old he worked hard. There will be more about and from Phil later. Cyril’s training however was never pointless or thoughtless. He read a lot and thought a lot about the sport. 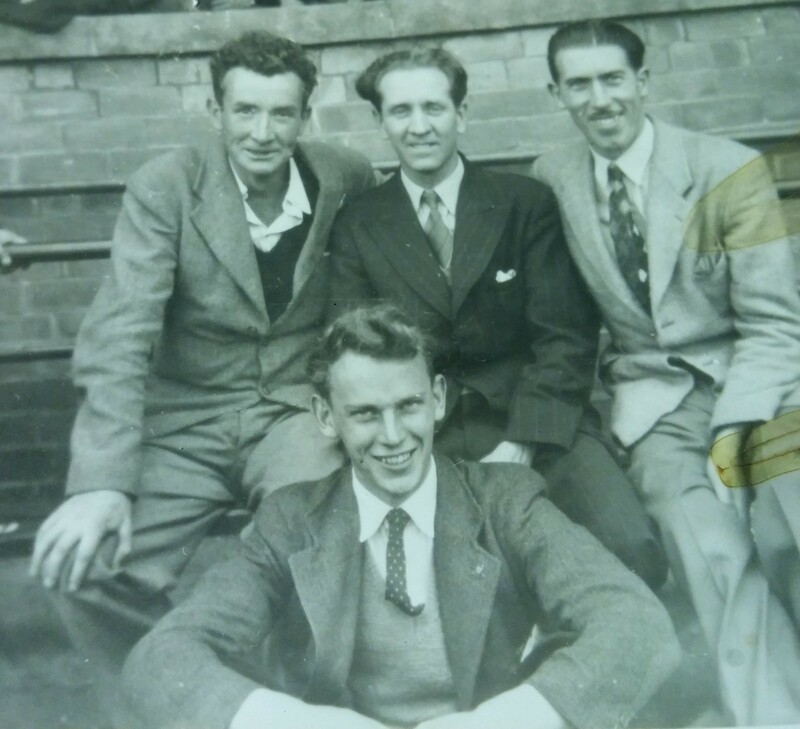 He went to any meeting or lecture that he thought would help him: Forbes Carlisle the great Australian swimming coach was speaking in the Clydebank Public Library and Cyril was there – was Carlisle not coach for the Konrad twins? Was swimming not also an anaerobic event? He went to seminars held by the cycling club – was that not relevant as well? When he was given a subscription to the ‘Runner’s World’ magazine by his daughter Moira he devoured it and discussed the articles at training and even on the hoof during the runs. He could talk about the cardio vascular system in a way that few other club runners I have met could, he knew about the training of Vladimir Kuts and about ‘active rest’ days. For a man without a great formal education he was learned in the ways of athletics. He did not however accept all that he was told. When as a teenager in Ireland he wrote to the great Joe Binks, a former world mile record holder about training he was told to curtail his training drastically and come down to three days a week. Cyril laughed at this and went on his own way. One of his dicta was that if you could not do the same session the next day, you were training too hard: it was not all thoughtless bashing out of the miles. Away from the track Cyril was as partial to a piece of venison as the next man and knew how and where to go about getting hold of it. Whenever he was in or near the hills whether on a family picnic, on a run or just out walking he kept a weather eye open for the marks and signs of their presence. He couldn’t stand snares and any he found were torn up and thrown as far away as he could manage. We all had a tale to tell about this and Phil’s goes as follows: “I had occasionally run up the Humphrey Road into the Kilpatrick Hills on my own, so one day Cyril suggested a run up the Humphrey. This was quite out of character but thinking it was a pleasant change I agreed. We made our way up the hill and just before the first gate he beckoned me to leave the path, jump the fence and make our way up the grassy slopes and into the woods. Suddenly it all became clear – he was surveying the wildlife and seeing what gamekeepers were on duty. As the years rolled on the pattern became familiar. Many a meal of venison, wild fowl and home baking I would enjoy over the years. The other great thing about Cyril was his impish sense of humour. He was like a wee boy sometimes with his jokes and tricks. He had trouble at one time with his heel and there was a big swelling on it. He saw the doctor and when asked at the club what the solution was he said that they could cut a big cross in the swelling, peel back the skin and scrape out the problem tissue. Was there anything else they could do was the next question to which he replied that, well, there were some wee tablets you could take! After a particularly good run on the second stage of the Edinburgh to Glasgow Relay he ran in behind Adrian Jackson of Edinburgh University. When it was put to him that he might have overtaken him Cyril replied that he just could not bring himself to pass a green jersey! In reality he had run a superb race. Crossing the moors above Clydebank he would tell you to bear right, bear right and when you looked up he was haring off to the left. When the Road Race organisers at the Babcock’s Sports decided one year that runners would have both individual numbers and also team numbers, most just wore their individual numbers but Cyril wore both, one above the other, just to confuse the officials! He was also very gregarious and generous: I went in one night to collect an ‘Athletics Weekly’ that I had loaned him and ended up with a dish of stew and potatoes and a big spoon in my hand – plus a glass of clear liquid from an Iron Brew bottle that did not contain Iron Brew! His family – wife Noreen and daughters Moira and Pat were all well known in the club and all ran at some time or another. Pat did not stick at it because of her asthma but Noreen became a veteran international runner and Moira of course ran for Ireland in Olympic and European Championships in the marathon. He won many club championships at a time when the club with John Wright, George White and Pat Younger was very strong. At County level he won the track One Mile and Three Miles championships more than once, on the road he won the Balloch to Clydebank several times, he won the cross country championship and had the fastest time in the county cross country relays. In the National Championships he was in the first ten twice. His best run in the National was probably in 1955 when the club was third. 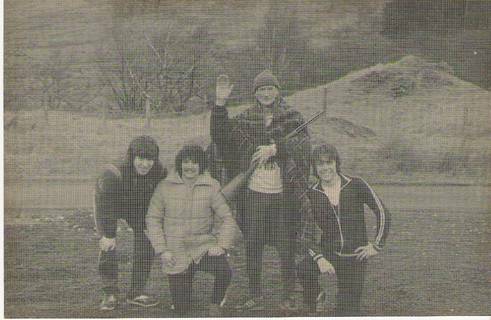 They had all trained as a group that winter with Cyril missing the late night Monday and Wednesday sessions because as a seasoned runner who could train during the day he did his own training then while joining in with the lads on Tuesdays, Thursdays and at weekends. He was sixth that year and should have been selected for the international but was not picked because of his Irish nationality. It was a close vote in the selection committee where he only lost out by one vote – and the Clydesdale representative voted against his inclusion! His record in the Edinburgh to Glasgow eight stage relay is also a good one. His best runs in the event were in 1955 when he was on the longest stage against some of the top men and turned in the sixth fastest time; in 1959 when he had fifth fastest again on the sixth stage. Generally in the first ten times and but for one race he was chosen for the most difficult stages – the very high quality second stage and the long sixth stage. 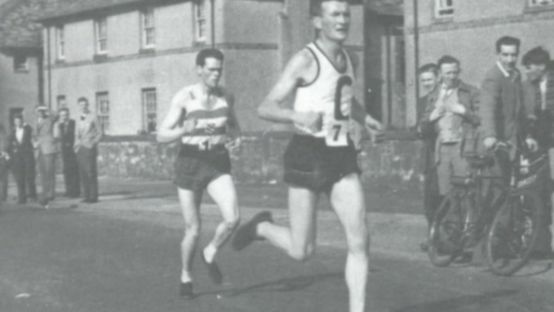 “A surprise victory to some but not those in the know was the success of Cyril O’Boyle, now of Clydesdale, who had a comfortable margin over the much improved A McDougall (Vale of Leven) and Gordon Dunn (Garscube) in the Dunbartonshire 7 Miles Championship. The class of O’Boyle becomes clear when we learn that he won the Eire 4 Miles Championship last July in 19 mins 48 secs and was second in the Mile when he and the winner both clocked the same time of 4:24 in an entry so large that it looked like a cross country start. He then listed the first six in what he considered finishing order: 1. Bannon; 2. O’Boyle; 3. Joe McGhee; 4. AH Brown; 5. J Stevenson; 6. D Henson. The actual finishing order was Henson, J Stevenson, McGhee, Binnie, T Stevenson, O’Boyle and Bannon. Cyril was 45 seconds behind the winner. And 15 seconds ahead of Bannon. Cyril went on to run well enough the following summer without too much racing involved but the following winter he started in the DAAA Relays where he ran the second stage in the team which was second to Garscube Harriers in the third quickest time of the day. In the Midlands Relays at Stepps he had the fastest club time by 19 seconds from John Wright in a team which finished sixth. He then ran in the Midland District Championships at Lenzie where he finished 16th – one place behind John Wright – with the team placing third. This time in the ‘Scots Athlete’ Emmett Farrell was only predicting a first ten placing for Cyril in the National. Then he wrote:“Cyril O’Boyle is an enigma. In the mood he could probably win outright this race, on the other hand he can be without fire. The wide open spaces of Hamilton may suit him more than the tight Lenzie trail. 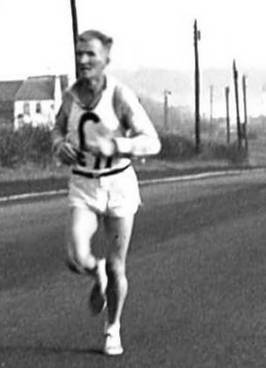 Colleague George White perhaps running better now than at any time in his career may fail to earn a jersey only because there are so many classy runners in the field.” Living up to his enigma status Cyril did not run at Hamilton where George White was thirty first, ten places ahead of Jackie Higginson. Emmett was spot on with his remark that Cyril was an enigma. It might be that he felt within himself that he had nothing left to prove having won National titles in Ireland and with a handful of wins in Scotland; it might just have been in his easy going nature that made him an in-and-out kind of athlete, he might just have been lacking self discipline or self confidence. The truth was probably at least in part down to a series of bad injuries. From time to time the ‘Clydebank Press’ used phrases such as “Cyril O’Boyle’s troublesome tendon…” or “A recurrence of an old injury …” Whatever the reason was, for the remainder of his time with the club he had superb runs interwoven with very ordinary performances. For example the following cross country season he raced sparingly with a time slower than John Wright in the McAndrew Relays, then he had the third fastest time in the County Relays followed by the second fastest time for the club in the seventh placed team in the District Relays at Stepps with 14:27 behind John Wright’s 14:07 which was the sixth fastest of the day. As for the National, he did not run there. A lot of the inconsistency could be put down to injuries that came with increasing frequency as time progressed which hindered training and racing. His influence on the club had been wider than his own racing however: he could motivate others, he could get them talking about training and racing and generally added to the club spirit. He gave the others a good feeling about themselves. For the rest of his time with the club he ran when he could and was actually turning out at times in the early 90’s before returning to Ireland. At one point he was only coaching/advising two athletes – Phil Dolan and his own daughter Moira. When they were both selected for the international cross country championships in Wrexham in the same year he claimed to be the only coach who had a 100% success rate for international selection. Incidentally Moira was a regular member of the Irish team after they returned to Ireland and was a top class marathon runner with times inside 2:40 for the distance. She ran in Scotland in the 1986 Commonwealth Games event (as Moira O’Neill) where she finished eighth in 2:42:29. Other than that she won the Belfast Marathon twice (1985 and 1986) and the Dublin Marathon twice (1988 and 1989). She set Northern Ireland records for the 15K (56:16), 10 Miles (58:29), Half Marathon (1:15:57) and Marathon (2:37:06). Then there was the time when he went with the family to Ireland on holiday and he won the veteran’s race at a local meeting with Moira winning the Ladies race, Noreen being first Lady Veteran and Pat? Well she won the beauty contest! What a family! Regardless of his reputation as a coach, poacher or practical joker he was justly remembered as a top flight athlete on both sides of the Irish Sea. Phil has yet another tale to tell: “In 1970 I ran in the Peel Hill Race in the Isle of Man and won beating Maurice Herriott in the process. The result was on Manx Radio and when I got back to my hotel I entered the lounge to partake of the traditional supper. There was an Irishman on holiday who had been listening to the radio and when my pals began to talk about the evening, the Irishman began to chat. It transpired that he knew of Cyril and his exploits in the Irish Four Miles Championships. He confirmed that Cyril was indeed very well known in Ireland and if his reputation needed increased in my eyes, then that meeting confirmed it! After he retired and returned to Ireland many of the Harriers travelled over to visit him and received the warmest of welcomes. 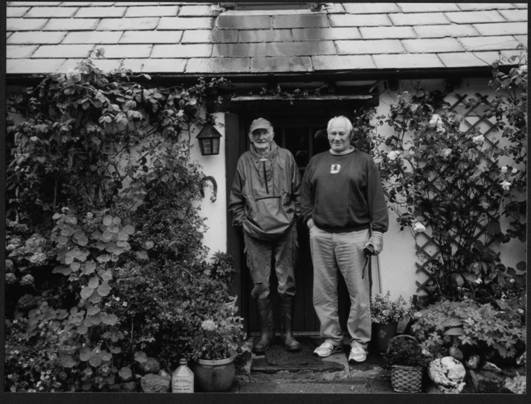 The picture below is of Cyril on the left with another Harriers legend, Pat Younger, outside his little cottage. In 2001 Cyril was ranked number six in the World M75 10,000 metres track ranking lists with a time of 46:54.93 which he ran in Brisbane, Australia on 9th July of that year. (www.masterstrack.com/rankings2001/10km.html) This was an Irish Masters Track and Field Record. He also raced in the World Vets in Gateshead in 1989 where as an M70 veteran he clocked 6:03.27 for 1500 metres, in the World Cross Country in 2001 as an M75 he was fourth in the cross country in 39:20. He was also entered for Championships in Potsdam in Germany (2002) and Aarhus in Denmark (2004).